You know the house. 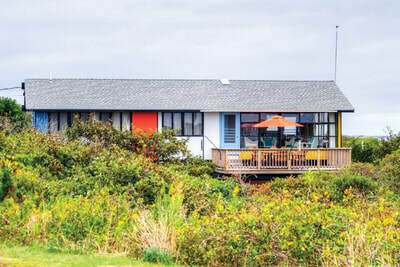 It’s the brightly painted cottage, one of only three that sit beachside on Moshup Trail with views over the dunes to the ocean and the lighthouse. The sound of the surf and smell of the sea surround this charming home that’s only steps away from the private beach. At night with just the stars for light, it’s like a tranquil cocoon. 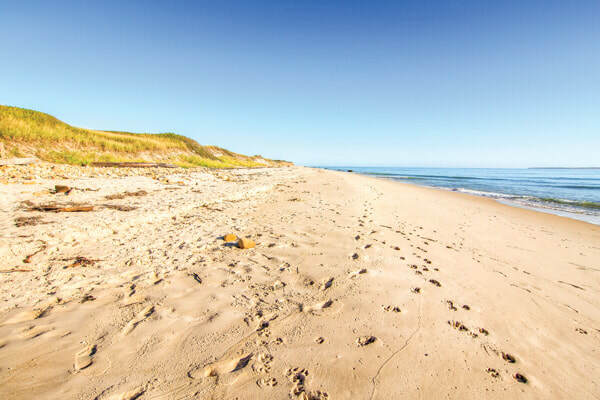 Aquinnah has been a tourist destination for more than a hundred years but was never easy to get to, which many believe helps keep it a wild and treasured place. In the 1880s steamboats docked by the cliffs and were met by residents with ox carts who toured passengers around the area. 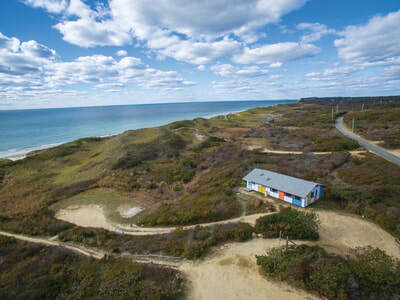 Aquinnah did not get electricity until the 1950s, making it one of the last towns in the commonwealth to receive service, right about the time the owners discovered this spot. Before Moshup Trail was paved periodic flooding washed out the road, making it little more than a dirt path. Not realizing that the beach was private, they headed over the dune, and after a magical day of swimming and building sand castles, they knew they had found their place. When they were lucky enough to discover land for sale at this same location, they envisioned building a tent platform. “The next year we completed a foundation,” she said. “But the tent platform began to look less like a place to put up a tent and more like the floor of a house.” Over the winter of 1959 they designed a model of the house and chose sheets of wood for the exterior walls with battens over the seams. 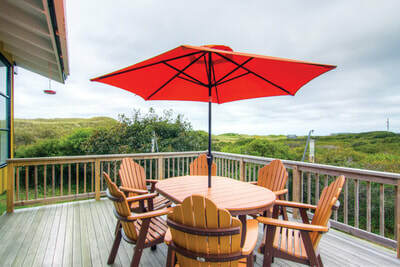 Settled into the dunes, the cottage’s easygoing charm creates a carefree summer retreat. Vaulted ceilings finished in warm pine enhance the rustic camp atmosphere. 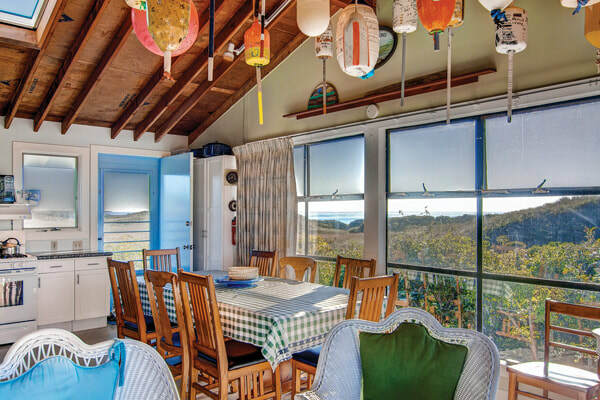 The open living space has views from three sides through floor to ceiling windows that frame the picturesque setting and the view to the Gay Head Light. This combined living/dining room and updated kitchen offer a spacious family gathering spot. 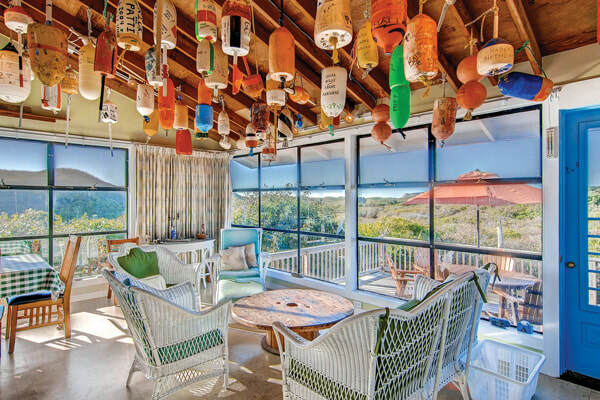 Commanding ocean views and breathtaking sunsets are revealed from indoors or out on the dining deck. Six cozy bedrooms share one full and one half bath. There are more than 530 feet of private beach, a combination of the 538 Club and Zach’s Cliffs Beach, and there are access easements over the property. Recent upgrades include a new well, roof and six-bedroom septic system. Because the house is in the Coastal District, there are restrictions on expansion and relocation. ​ This is an extraordinary opportunity to own one of only three houses on the south shore beach in Aquinnah.